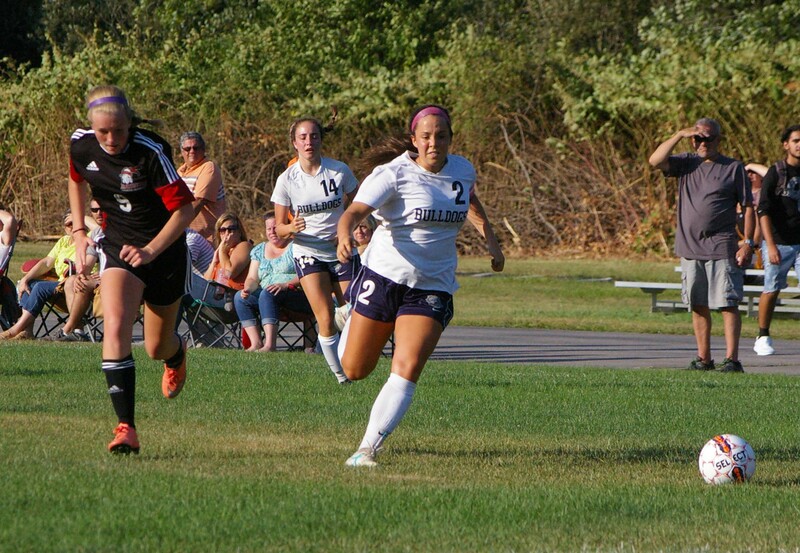 It was a busy night for the town of Rockland with the girls varsity soccer team’s second round tournament game, Pizza Palooza, and the volleyball team’s second round match all happening on Tuesday, Nov. 7. Despite incredible plays from the volleyball team, and delicious all you can eat pizza in the gym, it was the girls soccer team that took center stage in an incredible quarterfinal tournament game against Plymouth South. In the frigid cold, under the lights in Veterans Memorial Stadium, the Dogs battled to a double overtime 2-1 victory. The game ended on an incredible strike from senior captain Grace Oliver from way out to secure the victory in golden goal fashion. As the ball settled in the back of the net, the Dogs sprinted onto the field to celebrate their win, a moment senior captain Jaymie Atkins won’t forget. “My favorite moment was when we scored in double overtime to move on to the third round of the tournament. I just remember running onto the field to hug everyone,” said Atkins. The girls soccer team had an impressive season and their incredible tournament run topped it all off. Unfortunately, they lost in the semifinals in another double overtime game to Dover-Sherborn on Thursday night, Nov. 9. Coming just one game short of the South Sectional finals the girls continue to keep their heads up in reflection of their season. The Dogs had their ups and downs during the season, but they were able to put them all behind when it mattered most, in the tournament. As the Lady Dogs had a remarkable season, senior captain Grace Oliver had a lot to take away from this one, her last. One of Oliver’s favorite moments of the season was beating Hanover in a 2-1 victory in their first round tournament game, after losing to them two times in the regular season. The girls wish the same good luck to Oliver as she will take her phenomenal talent to UMass Boston next year. The Lady Dogs had four South Shore League all-stars this season in senior Oliver, juniors Madison and Nicole Blonde, and freshman Hannah Rich. Oliver and Madison Blonde were also EMass all-stars. With three of their four all-stars returning, the girls have high hopes that they will continue to have plenty of talent and success next year. Although fall sports have come to an end, the Lady Dogs and Bulldog Nation can’t wait for next year to see what the team has in store. The girls soccer team honored their seniors on Oct. 23 before their game against Norwell, a tough 2-1 loss. Congratulations to seniors Jaymie Atkins, Hannah Boben, Erin Field, Sydney McKenna and Grace Oliver. Jaymie Atkins and her parents, Brenda and John Atkins. Hannah Boben and her parents, Cara and Ronnie Boben. Grace Oliver with her parents, Jean and Bob Oliver. Erin Field with her parents, Caroline and Lee Field.